We've rounded up the latest rental listings via rental site Zumper to get a sense of what to expect when it comes to scoring housing in San Francisco with a budget of $3,500 / month. In the apartment, look for hardwood floors, a dishwasher and granite countertops. Amenities offered in the building include on-site laundry and garage parking. Pets are not permitted. Walk Score indicates that this location has excellent walkability, is bikeable and has excellent transit. Next, there's this 1-bedroom, 1-bathroom apartment situated at 140 South Van Ness Ave. It's also listed for $3,500 / month for its 795-square-feet of space. In the furnished unit, there are a mix of hardwood floors and carpeting, a dishwasher, in-unit laundry, a balcony, stainless steel appliances and plenty of windows. Animals are not welcome. Walk Score indicates that the area around this address is extremely walkable, is easy to get around on a bicycle and is a haven for transit riders. Here's a 1-bedroom, 1-bathroom apartment at 8 Henry St. that's going for $3,500 / month. In the unit, you'll get high ceilings, in-unit laundry, hardwood floors, granite countertops and stainless steel appliances. Pet owners, inquire elsewhere: this spot doesn't allow cats or dogs. According to Walk Score's assessment, this location is a "walker's paradise," is great for biking and is a haven for transit riders. Next, check out this studio condo that's located at 77 Van Ness Ave. (at Fell Street & Van Ness Avenue). It's listed for $3,500 / month. In the unit, you'll get hardwood floors, a dishwasher, in-unit laundry, a walk-in closet, floor-to-ceiling windows, stainless steel appliances and marble countertops. When it comes to building amenities, anticipate garage parking, a roof deck, an elevator, storage space and secured entry. Pet lovers are in luck: cats and dogs are permitted. Per Walk Score ratings, the area around this address has excellent walkability, is great for biking and is a haven for transit riders. Located at 3655 Broderick St., here's a 1-bedroom, 1-bathroom apartment that's listed for $3,500/ month. In the unit, you can expect hardwood floors, a walk-in closet, stone countertops, stainless steel appliances and wooden cabinetry. The building has on-site laundry, assigned parking and an elevator. Good news for cat lovers: kitties are welcome. According to Walk Score's assessment, the area around this address is quite walkable, is quite bikeable and offers many nearby public transportation options. Here's a 779-square-foot 1-bedroom, 1-bathroom condo at 101 Lombard St. that's going for $3,500 / month. The building boasts garage parking, outdoor space, a swimming pool, a roof deck, an elevator, secured entry, on-site management and a residents lounge. In the condo, there are high ceilings, a dishwasher, in-unit laundry, a walk-in closet, carpeting, floor-to-ceiling windows and stainless steel appliances. Pets are not allowed. According to Walk Score, the surrounding area is extremely walkable, is fairly bikeable and has excellent transit. Next, check out this 1-bedroom, 1-bathroom apartment that's located at 930 Pine St. It's listed for $3,500 / month. The apartment features a mix of hardwood floors and carpeting, a dishwasher and ample natural light. Assigned parking is offered as a building amenity. Pet owners, inquire elsewhere: this spot doesn't allow cats or dogs. According to Walk Score, this location is a "walker's paradise," is relatively bikeable and is a haven for transit riders. 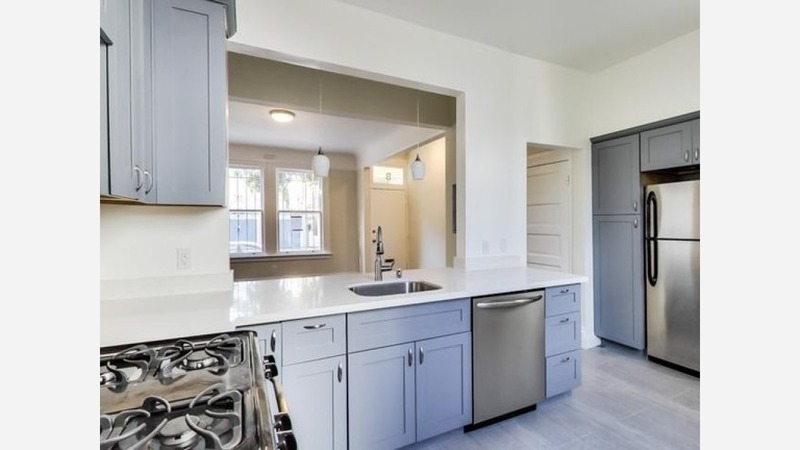 Located at 1026 Folsom St. (at Folsom & Harriet streets), here's a 700-square-foot 1-bedroom, 1-bathroom apartment that's listed for $3,500 / month. In the unit, you can anticipate hardwood floors, in-unit laundry, a fireplace, a patio, stainless steel appliances and a dishwasher. The building features garage parking. Neither cats nor dogs are permitted. Walk Score indicates that the area around this address is a "walker's paradise," is a "biker's paradise" and boasts excellent transit options.